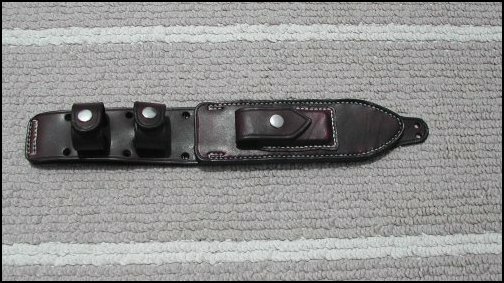 Below is a pic of the sheath I make for the Ek Commando Knife. The same style sheath will fit the Model 5 Bowie and the other models such as the Model 4. The only difference is the cutout for the blade in the welt layer to insure a good, snug fit for the model the sheath is being used for. 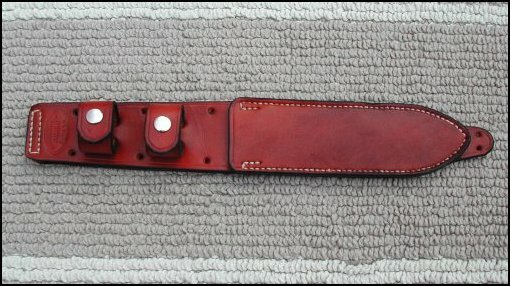 If you need a sheath for the Model 5 Bowie let me know. The original sheaths used Velco on the straps, which was not a good idea. I use nickel snaps.